Want to give your home that romantic ambiance that only candles can give, but don’t want to deal with all the drawbacks of traditional candles (such as hot dropping wax, smoke, and other safety hazards). Then we have just the product for you! Battery operated, flameless LED candle lights simulate almost perfectly the lighting effects of actual candles but contain none of the disadvantages. They are perfect for weddings, parties and any other special occasions in your home that require a touch of romance and tradition. Read on as we explore what these lights are all about, their many advantages, and what to consider in purchasing a suitable set of such lights for your home. And to make the latter task even easier for you, we have included our own selection of the very best battery operated LED candle lights on the market right now, with reviews of each. First though, a primer on LED lighting. An LED – or light emitting diode – is a device that converts electrical energy into light. In contrast to conventional incandescent lights – which rely on the phenomenon of candescence (heating something until it glows) to generate light – LEDs instead utilize a process known as electroluminescence. This involves passing an electric current through a semiconductor material so that electrons are knocked loose from the surface of the material – and in the process emit quanta of electromagnetic energy which appears to us as light. It’s very simple, and LED lights do their job of converting electricity into light very well. In fact, compared to conventional lighting technologies like incandescent and fluorescent lights, LEDs are legions more efficient and long-lasting. They also deliver a better light quality – free of flickering, humming, glare and all other problems that have long plagued older technologies. For this reason, LED lights are now finding their way into all sorts of lighting applications, domestic and commercial alike. You can now find LED lights in your home, car, the screens of your smartphone, tablet and other electronic devices – and a whole lot more. Due to their superior efficiency, LED lights are even being touted as one of the solutions to our current set of environmental and energy crises. One of the more recent and novel applications found for LED lighting technology is the battery operated LED candle light. This light is designed to replicate the soft, shimmering, flickering effects given off by actual candles- but without replicating the drawbacks of candles, such as hot dripping wax, smoke and so on. Though in most cases made from real wax, they contain no flame or burning wick. Rather the light is built into the body of the wax and generates light via the generation of electricity by a battery. Due to their superior energy efficiency, precision and the small sizes that LED lights are capable of reaching – it is a task to which LED lighting technology is very well suited. As mentioned, LED candle lights replicate very nicely the lighting effects of actual candles, but manage to bypass many of the hazards of candles – like smoke, hot, dripping wax that has the potential to ruin the insides of your home, and so. As such, these lights are completely risk-free and safe to use around children and pets. What’s more, as they are battery operated, they aren’t reliant on access to mains electricity and hence there is no limit as to the places in your home that you can place these lights. In addition, they utilize cutting-edge LED lighting technology, and so the lifespan of these lights and the length of time between battery replacements will be quite substantial. There is now a wide selection of battery operated LED candle lights out there on the market, and they differ markedly in their quality and the range of features they include. Here are the things you have to consider in purchasing a set of these lights that is suitable for your need. First of all, you need to think about how many of these lights you will require for your home. LED candle lights come in packs of 2, 3 and more (all the way up to 24 in some cases). Consider your lighting needs, and choose accordingly. The light output or brightness level of your candle lights is another thing you need to take into account – measured in lumens, this is something you will find in the product specifications that come on the product label of your lights. Secondly, do you want to have the ability to utilize a timer with your lights? For example, so that they come on automatically at a certain time of the evening, then switch off automatically a set amount of time later? Do you want to be able to adjust the brightness level of your lights, and the frequency with which they flicker and so on? Then consider purchasing LED candle lights that contain these features. Another thing you have to look at is if batteries are included with your candle lights of choice, and also what type of batteries they run on, and how easy they are to obtain and then insert into the lights. Many of these lights run on standard AA or AAA batteries – whilst they may not be already included with the lights, they are very easy and affordable to obtain, both initially and when replacement is due. Having taken a look at what battery operated LED candle lights are all about, their many advantages and benefits, and what things to look for in purchasing a set of such lights that are suitable for your home – the time has come to consider some actual lights! Read on for our selection of the ten best battery operated LED candle lights out there on the market right now, with reviews of each one. So without further ado, let’s look at some lights! LED candle lights, replicate the flickering effect of actual candles. Battery operated. Energy efficient and long lasting LED lighting. For a home lighting experience that combines the romantic feel of traditional candles with the benefits of cutting-edge, efficient LED technology – you can’t go past this offering from Haylie Chery. They make for ideal centerpieces at your special events like weddings, Halloween, Thanksgiving, parties, Christmas etc. 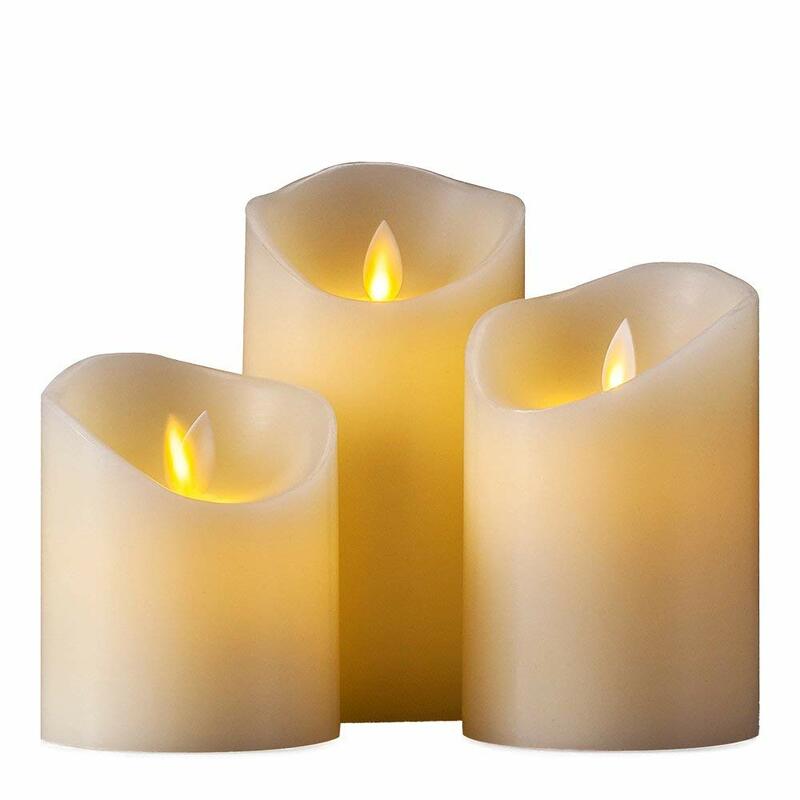 This set of 4 candles is made from real wax, and replicate the flickering effect and amber-like glow of actual candles. However, they also bypass many of the hazards of conventional candles; including the risk of fire, messy wax to clean up – and many normal candles are also poisonous to children and pets. These candle lights, however, are completely flameless; they are also easy to use, simply turn on/off – there is a switch located at the bottom of the candle. Two AA batteries are needed per candle – the batteries are not included. Another fine feature of this product is the inclusion of a 5-hour timer – so you can program your lights to come on at dusk and turn off a few hours later, maximizing your own convenience. Finally, these candles utilize cutting-edge LED lighting technology, so you can be sure these are some of the most efficient, long lasting AND eco-friendly set of lights around. The Hayley Cherie flameless LED candles are a great source of ambient lighting for your home on special occasions – and during the rest of the year – these battery operated Christmas candles are well and truly worth the investment of your time and money. 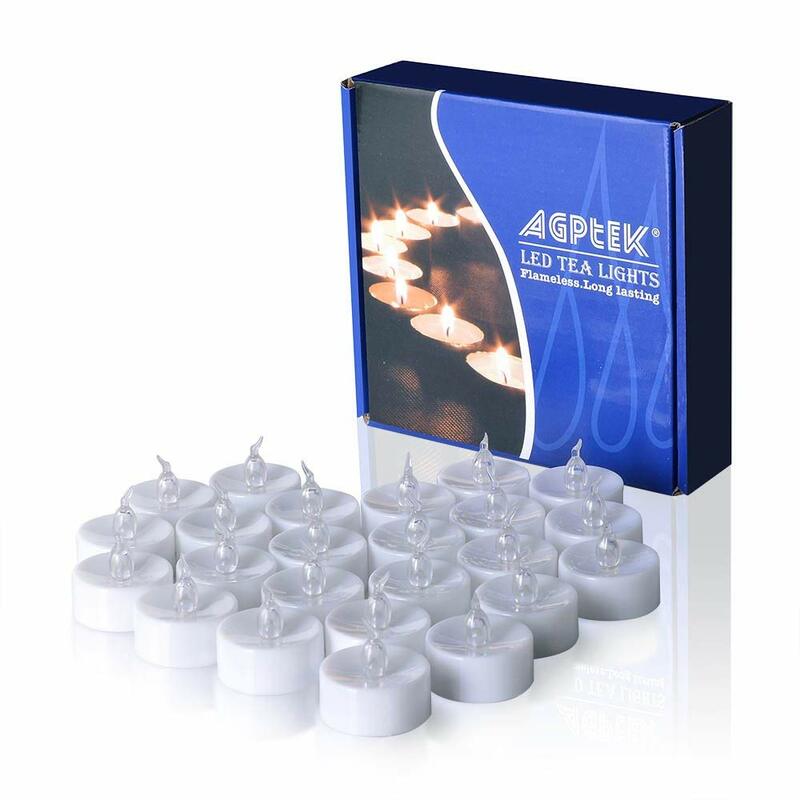 LED battery operated tea candles, perfect for special events and general purpose mood lighting in your home. Flameless and wax-free. For some unique decorative lighting that is also energy efficient – you can’t go past this offering from AGPtek. 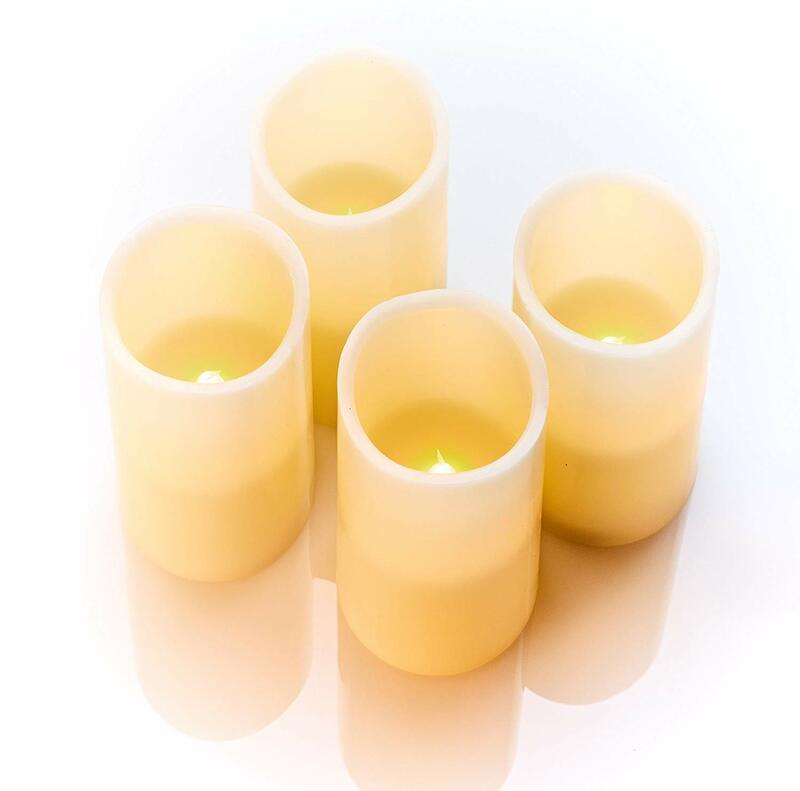 Ideal for use at special events or as general mood lighting within your home, these tea lights are easy to use with a simple on/off switch; and 100 per cent safe to use. Completely flameless, they are made from plastic, so no hot, dripping wax to contend with or clean up. You can use them around pets and children with security and peace of mind as well. Twenty four such tea lights are included in the box, and each has one CR2032 coin battery built into the light. Last but not least they are backed by a 100 per cent satisfaction guarantee – if you are in any way dissatisfied with your tea lights, you can return to the manufacturer within the first 30 days and a get a full refund. Choose AGPtek’s battery-operated flameless candles and enjoy some romantic, ambient lighting and efficient, high tech LED lights, all in the one package. 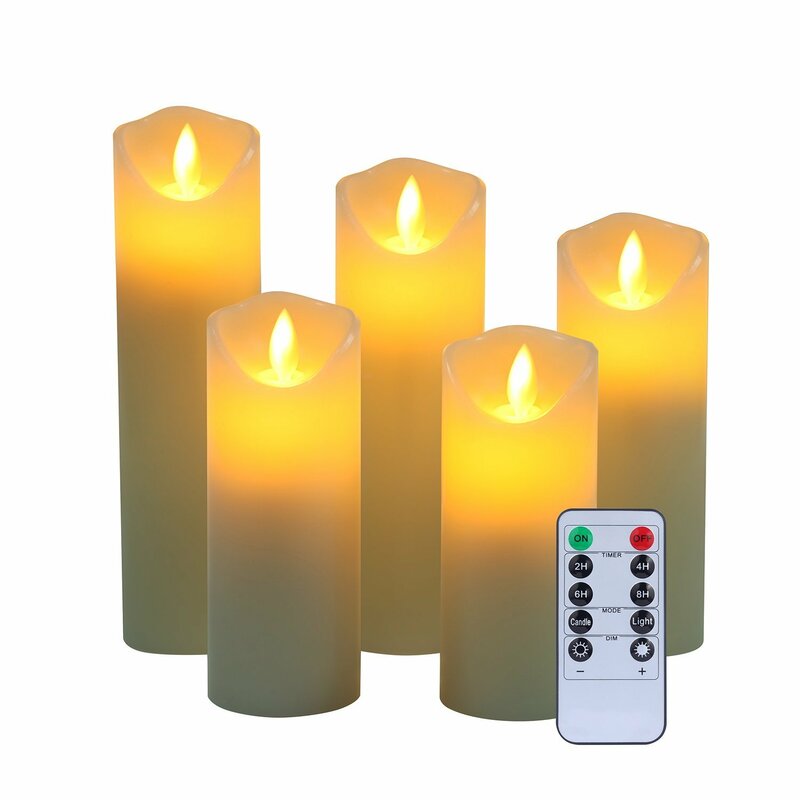 These remote control flameless candles are some of the best lights of this sort out there today. LED candle lights, replicate the lighting effects of actual candles – but with none of the smoke- and fire-hazard, or mess to clean up. LED Lytes have really outdone themselves here. Their flameless LED candles are the stuff of pure quality. Made with real wax, they emit the same soft glow as real candles – and will give your home the same warm, welcoming glow. Use them at weddings, Christmas parties or other special events; or simply use them as general purpose mood lights throughout your home, or as night lights in your children’s bedrooms. Whilst these lights feature all of the benefits of conventional candles, they include none of the drawbacks – like toxic smoke or hot, dripping wax. It is a complete child- and pet-safe product! Easy to use with easy on/off switch, these lights run on CR2032 batteries (already installed), which are also very easy to replace. Perhaps best of all, these LED flickering candles utilize cutting-edge LED lighting technology, so you can be sure when buying this product that you are getting a set of lights which is energy efficient, long lasting, and good for the environment to boot. With this product from LED Lytes, you get all the benefits of traditional candles with none of the drawbacks. In addition, they make use of cutting-edge LED lighting technology that is some of the best around. You can’t go wrong with these battery tea light candles – this is some really fantastic decorative lighting. LED candle lights, ideal for any home – will give it a warm, welcoming atmosphere. Battery operated, and with 10 key remote control included. Here we have this flameless LED candle set from HW. It features 5 LED candle lights, whose flickering flame technology replicates the lighting effects of real candles. Despite that, they are completely flameless, and mess-free – no smoke, flame or dripping wax to clean up. You can use these lights at weddings and other special events, or as general purpose mood or ambient lighting throughout your home – and enjoy a completely safe lighting experience. This battery operated taper candles are battery powered lights, each runs on 2 AA batteries (NOT included) that will provide over 300 hours of lighting activity. What’s more, these lights are controlled using a 10 key remote control timer that enhances the convenience and ease of use of these lights. Select between different brightness levels, flickering options, and timers (2,4, 6 and 8-hour options are available). Last but not least this is LED lighting technology, so you have the potential to save loads of money on power bills here due to the superior efficiency of these battery powered candles. Conventional candles offer attractive decorative and ambient lighting but come with many associated hazards. You can avoid most of those with these HW flameless LED lights. Go out and grab a set for your place today. Pleasing lighting effects –a nice, warm glow – exactly like real candles! LED tealight candle lights – resemble the soft, flickering glow of actual candles. Utilized cutting edge LED lighting technology. Ten year warranty. Enjoy flickering amber light that simulates the effect of burning candles in your home with this set of flameless LED candle tealights from CYS. Twenty four such lights are included with this purchase – each one looks just like a real candle when illuminated, but comes with no dripping hot wax, no mess, and no toxic fumes that make them unsafe to use around children and pets. They are ideal for weddings, parties and other events held in your home. Easy to operate, these flameless tealight candles come with a simple on/off switch and utilize batteries (specifically one CR2032 coin battery per light), that are easily replaceable. The batteries that come with these lights last up to one hundred hours as well – far superior to comparable products on the market. And as these are LED lights, they are tremendously efficient and long lasting as well. Finally, this set of lights is backed by a 100 percent money back guarantee, so that in the event that you are in any way unhappy with your purchase within the first 30 days, you will receive a full refund, no questions asked. To boot, the lights are backed by a 10-year limited warranty protecting you against defects in workmanship and design. If that doesn’t give you complete and utter peace of mind when making this purchase, then we don’t know what will! 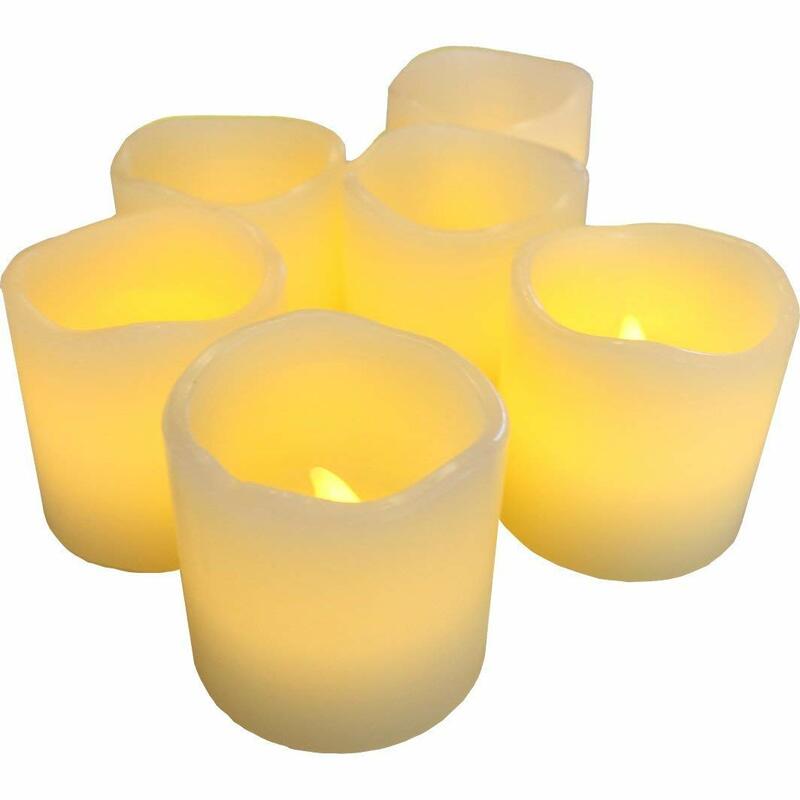 ‘Warm ambiance minus the mess’ – that is what the CYS flameless tealight candles deliver. Highly recommended. Go and grab some for your home today. These are some of the best-LED candles in town. LED tealight candles, just like real candles but with none of the mess. Wax-free and battery operated. Efficient LED lighting. Ideal for special occasions – or even if you just want to create a soothing, romantic atmosphere in your home of an evening – these flameless LED candles from Homemory are a great buy. Though they replicate almost perfect the soft, flickering lighting effects of actual candles – these LED candles with remote feature none of the drawbacks, such as hot dripping wax, mess and toxic fumes. Indeed, these candles are completely child and pet safe. What’s more, they utilize cutting edge LED lighting technology, which means they are some of the most efficient, long lasting lights around. Battery operated, they run on coin batteries that are already included in the lights, and have a 100 hours lifespan before replacement is required. Finally, these LED tealight candles are backed by a full, unlimited warranty and 30 days money back guarantee – so if you are in any way unhappy with your purchase within the first 30 days you can return to the manufacturer and get a full refund, no questions asked. Energy efficient, easy to use and aesthetically pleasing – the guys at Homemory have really hit a home run with this offering of theirs’. Well and truly worth the investment of your time and money. Flameless LED candles, will add a romantic touch to any home. Look just like real candles but with none of the safety risks. Utilize cutting-edge LED lighting technology. These flameless LED candle lights from GiveU are indistinguishable from real candles—but include none of the risks and drawbacks. Made from real wax, their slow blinking generates a flickering effect that is ideal for special events within your home, or simply for all-purpose mood lighting. 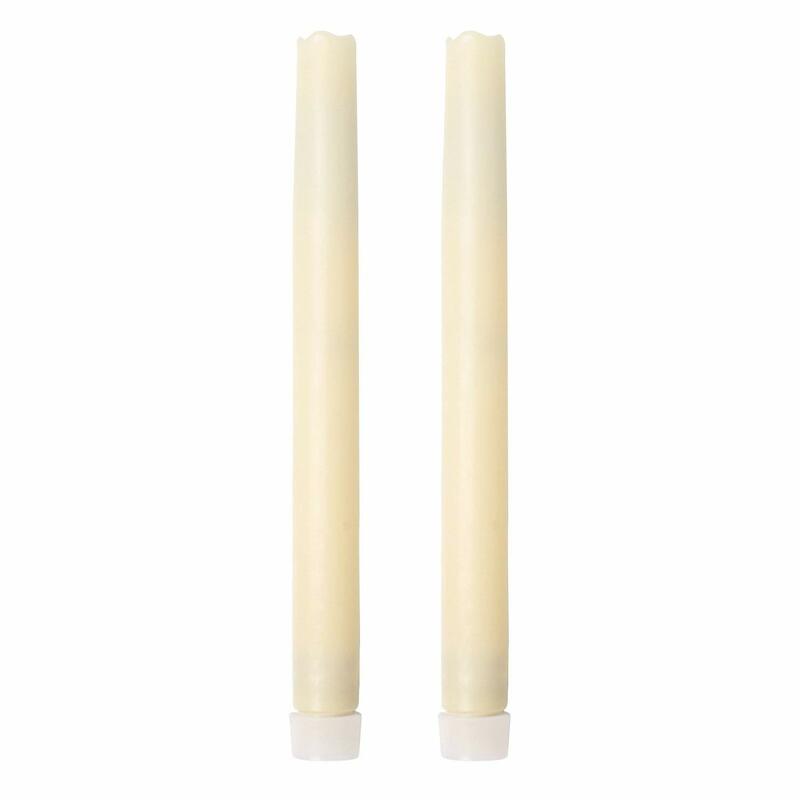 Each of these flameless pillar candles (two included in the pack) runs on two AA batteries (which are NOT included) that are easy to purchase and replace. In addition, the candles have built into them a 6 hour timer for your convenience, and can be turned on and off using easy on/off switch. No smoke, hot dripping wax or other mess to clean up, these candles are completely risk free – and safe to use around your children and pets. And as this is LED lighting, you can be sure it is without compare when it comes to energy efficiency and longevity. Finally, this set of battery powered candles is backed by a 100 per cent satisfaction warranty, so if you are in any way dissatisfied with your purchase, you can return to the manufacturer and get a full refund, no questions asked. Go out and give these flameless LED candles from GiveU a try today, they tick all the right boxes and will make a welcome addition to any home. LED tealights, will add an enchanting glow to any home. They deliver all the advantages of real candles but with none of the drawbacks. Good Electronics have produced a fine set of flameless LED candles here, they are to be congratulated. 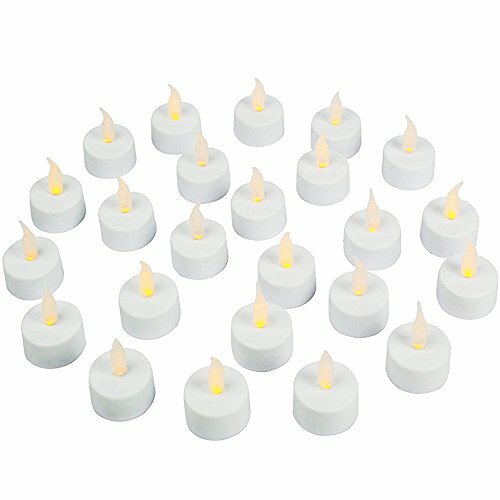 Each of the 9 lights included with this product are made from real wax, and simulate the lighting effects of actual candles, but are completely flameless and free of smoke, hot dripping wax, and the other hazards that come with real candles. Battery operated, the Good Electronics LED window candles each run on 2 AA batteries that are easy to obtain and just as easy to replace. 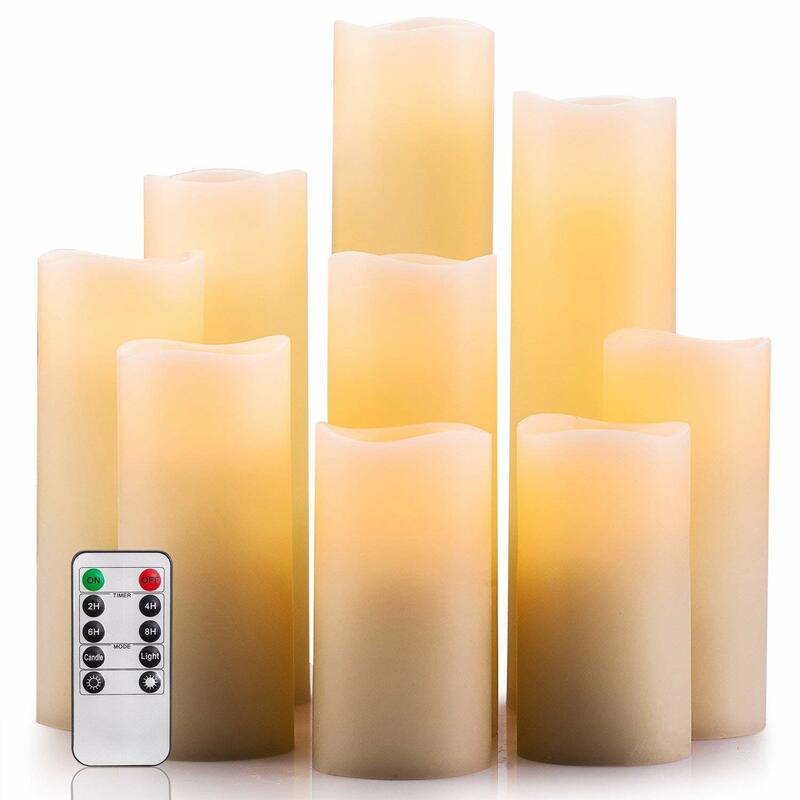 One user-friendly 10 key remote controls each of the candle, it includes on/off function, timers, and options to adjust the flickering and brightness levels of your lights. Finally, as this is LED lighting, it is some of the most efficient and long lasting lighting of this sort around. Use it for special occasions like weddings, Halloween, Christmas and more – it serves equally well as ambient or mood lighting in your home through the rest of the year. For a realistic simulation of actual candles that also utilizes cutting edge, energy efficient LED lighting technology, you could do a lot worse than choose this offering from Good Electronics. Their LED pillar candles are well and truly worth the investment of your time and money. 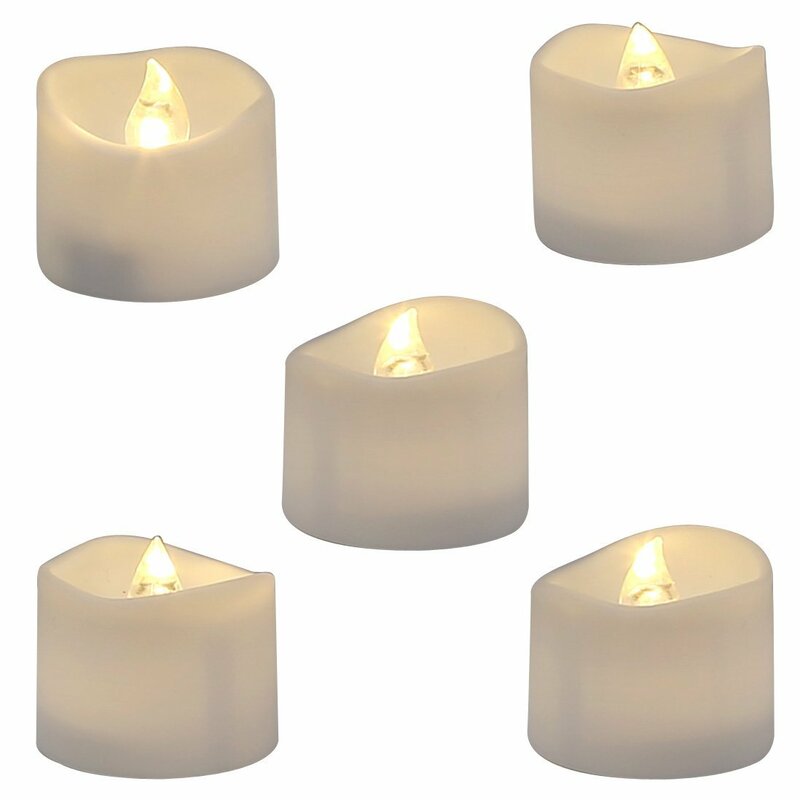 Set of 9 tealight candles, simulate the lighting effects of actual candles but with none of the safety hazards. They utilize cutting edge LED lighting technology. LED candle lights, add a romantic touch to your home but with none of the mess of conventional candles. These LampLust LED candle lights are safe AND beautiful. They feature 10 flameless LED candles each of which deliver a soft, shimmering glow that is just like a real candle – but minus the mess, such as hot dripping wax, AND the safety hazards, like toxic, poisonous fumes and smoke. They are suitable for weddings, parties and other special occasions in your home requiring a softer, more romantic ambience and mood. Each light runs on 2 AA batteries which whilst not included in the lights, are very easy to obtain, both initially and when the time comes for replacement. As this is LED lighting, you can be sure that the lifespan of these lights is substantial. 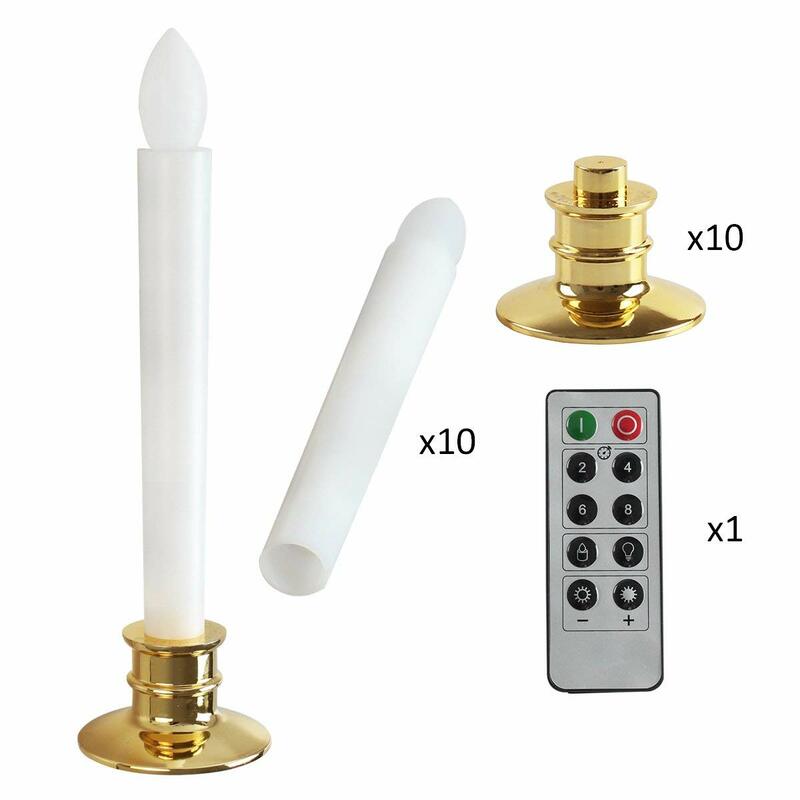 Also included is a remote control option, so you can switch your outdoor flameless candles on and off from afar, and also set them to switch on and off automatically at certain times (both 4 and 8 hour options are included here) Finally, this product is backed by a 90 days replacement warranty, giving you maximal security and peace of mind when making this purchase. Enjoy a warm, festive atmosphere in your home that is completely safe and risk free with his offering from LampLust, it’s fantastic value for money and will add a pleasing vibe to any home. LED candle lights, designed to float in water. Turn your home into an enchanted wonderland! Perfect for all special occasions. Completely safe and mess-free. Next we have this splendid offering from AGPTEK. These flameless LED candle lights float in water, including crystal vases, fishbowls and more, and will enable you to create an enchanting atmosphere within your home. Twelve lights are included I the box, each runs on one CR2032 battery – which is already built into the light. As these are efficient, long lasting LED lights, it is a long time before replacement will be required as well. Flameless and free of smoke, fumes and dripping wax, these battery operated candles with timer deliver all the benefits of candles but with none of the drawbacks. Completely waterproof, you can take them out of their water container, dry them down, and use them again as many times as you like. 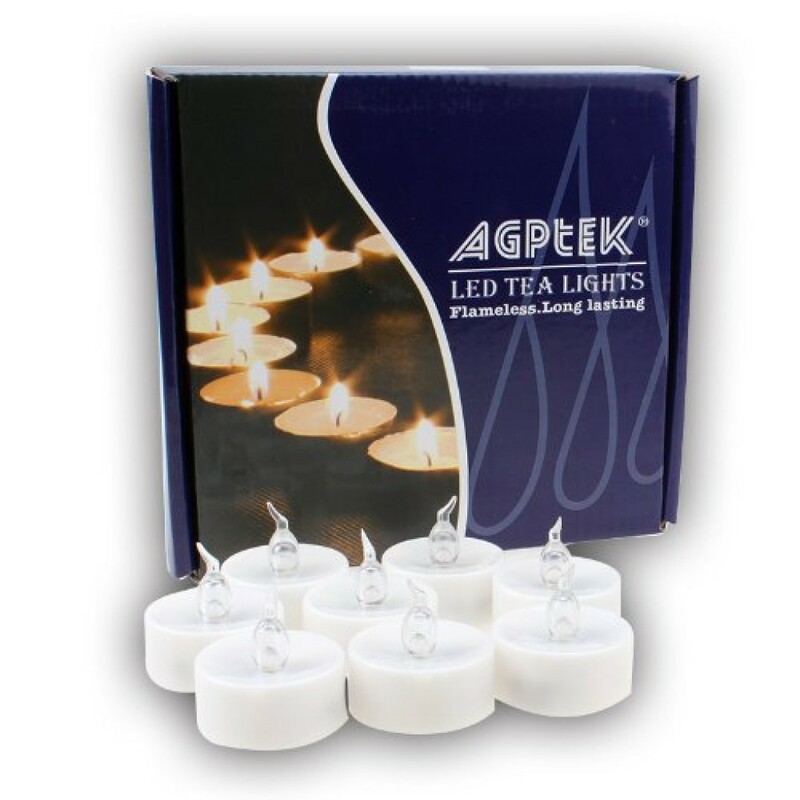 For a fantastic set of flameless LED candle lights, it is hard to go past this offering from AGPTEK, it is one of the best out there. Battery operated LED candle lights, simulate real candles but without the mess and hassle. Cutting edge LED lighting technology. Last but not least in this review article, we have this fine offering from CelebrationLight. Flameless LED lights, these devices replicate the soft, flickering glow of traditional candles, but minus the mess and safety hazards. If you want some nice decorative lighting for your home and for special occasions, then these are the lights for you – especially if you have children and pets roaming around the house! 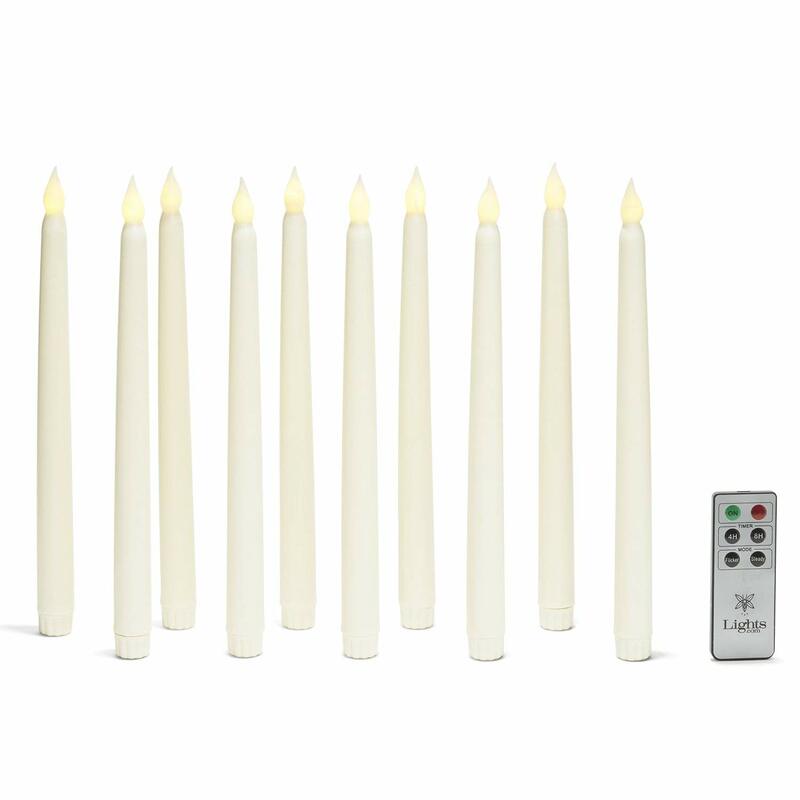 Ten remote control candles are included with this product, each one runs on 2 AAA batteries (not included), and has an expected lifespan of 300 hours before replacement is required. Also contained with this product is a remote control that allows you to adjust the settings of your LED taper candles from afar – including being able to choose from static flickering levels, different brightness options and timers (including 2, 4, 6 and 8 hour options). A mere flick of a switch is all it takes. Finally, these lights are backed by an 18 months product warranty, which offers you fantastic security and peace of mind. We’ve reviewed some very fine LED candle lights in this piece, and CelebrationLight’s masterpiece is one of the best around. It’s a great note on which to round out this review article. In this article, we have given you an overview of battery operated LED candle lights, including what they are, their many advantages as a decorative lighting option, and also what in our view are the best incarnations of these lights currently out there on the market. Hopefully, you now have a better idea of what these lights are all about, and the task of choosing a set that is right for your needs has been made a little easier. Good luck, and happy lighting! Next story How Do Solar Hot Water Heaters Work? Previous story Will solar panels ruin my roof?